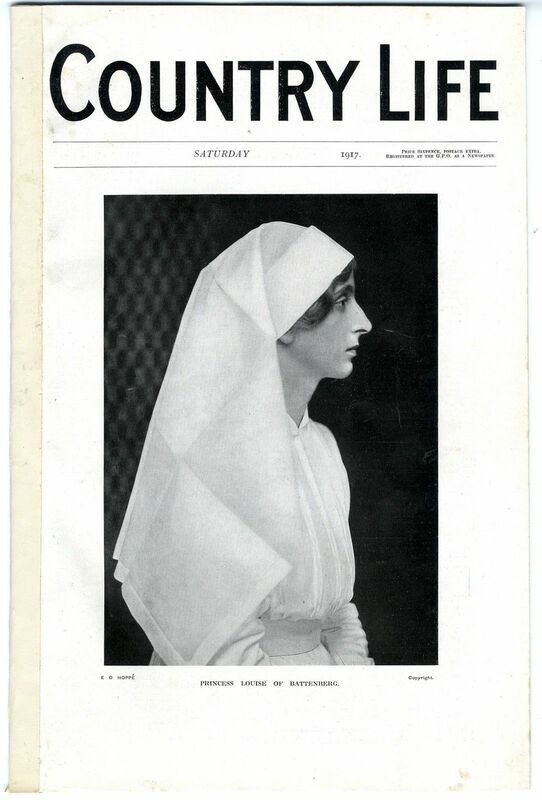 Cover Photograph: Princess Louise of Battenberg In Her Red Cross Nurses Uniform - Full page (fp) photo by Emil Otto Hoppé a German-born British photographer. Info. sister of (later k.a.) Louis Earl Mountbatten of Burma. Maxwell Court, Connecticut, USA. The Residence of Mister Francis T. Maxwell - x8 photos (incl. Garden Plan, and ground floor plan), and article by Samuel Howe. Info. designed by Charles Platt. Turners Drawings: Warkworth Castle; Falls of Anio; Salisbury Cathedral (fp) - x3 pics., and article by Sir Martin Conway on J. M. W. Turner.sleekburnc. The Lesser Country House: Thornfield, Hampstead Garden Suburb - x6photos (int. and ext.) 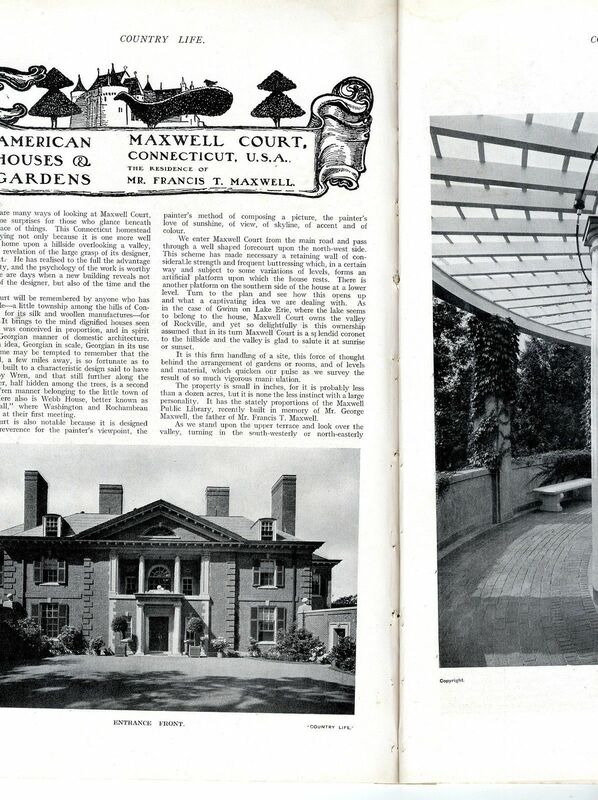 plus a ground and upper floor plan, and garden plan, with article by LW (Lawrence Weaver). These two pages appear to have been re-inserted, at some time, in the wrong order (see condition/dimensions report); there is a strip used to repair two tears to edge of page. After a little digging the house appears to be 2 Wildwood Rise, Barnet, London NW11 6SX - and was designed by Cyril Farey (who is mentioned in the incomplete article). Thornfield is also mentioned but I'm only assuming it relates to this house. (see scan). From the Memories de L'Institute Royal - very small sketch and correspondence on Agricultural Implements from A. E. Shipley Sc.D FRS. A Morning Cobweb - picture and correspondence from M. Perkins. c.keenlyside. An Evenly White Marked Mule - picture and correspondence from B. Lea-Wilson, 270 Brigade, RFA, EEF (Egyptian Expeditionary Force). A New Zealand Mounted Rifleman in the Sinai Peninsular - picture and correspondence from C. R. Fauer. One fp showing various: Burberry Top Coats - Hamptons Furnishings - Fox's FIP Puttees - Snake Charmer Cigarettes - repair to edge of page. 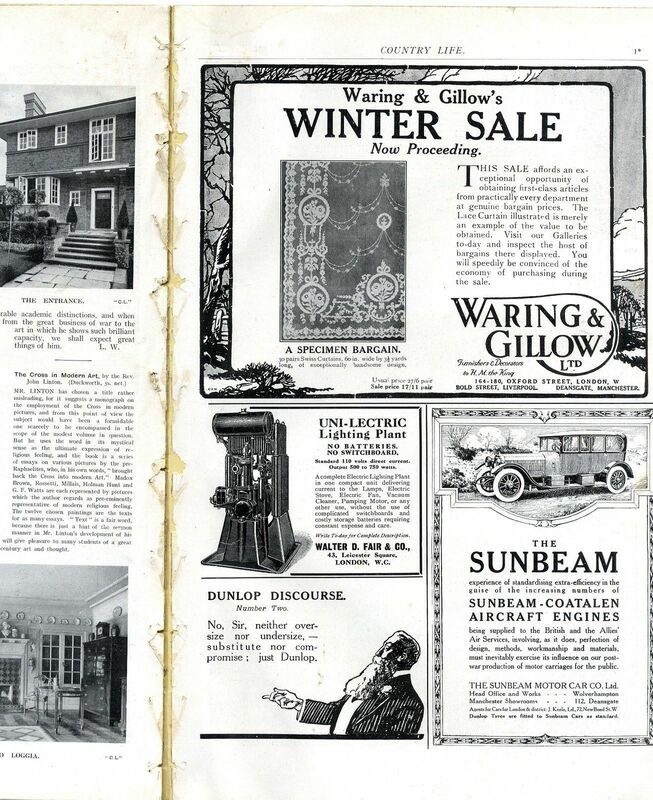 One fp showing various: Waring and Gillows - Uni-Lectric Lighting Plant Miel - Sunbeam Car - Dunlop. Country Notes with paragraphs mentioning: Mr Prrothero of the Board of Agriculture - Royal English Arboricultural Society and The Agricultural Relief of Allies Committee reive - Mr Edward North Buxton and Tribute to Capt. F. C. Selous - Mr Hodge MP Minister of Labour - Board of Agriculture - Food controller and Fishing - Munitions Department. On the Cultivation of Vacant Ground - by Dr E. J. Russell. How to Reclaim an Old Plantation - Correspondence from Ex-Forester of Harrogate. The Farm Tractor - From C. C. H. Coape-Arnold, Smockington, Hinckley. Small Holders and Food Production - From Small-holder. Independence of the Small Holder - from Yeoman. Agriculture in War and Peace - From E. J. Castiglione, Country Estate Offices, Carlisle. Bomb Dropping by W. Avery - an incident which occurred in France in February 1915 and a Pilot of the Flying Corps. Literature - Gray and Country Life: The Bicentenary of the Poet of the Elegy in a Country Churchyard (Thomas Gray) - by Herbert Warren. 14 pages (28 sides). It measures 365x235mm (14.25 x 9.25inches ). The titled, priced and dated frontispiece style page is present; but the outer cover, property, advertising, and other article supplement pages have been removed as it was bound without the exterior cover or end-pages/adverts. The outside spine has been reinforced/repaired at some time. The inside pages have binding witness marks throughout (see scan). The last two pages (article on Thornfield House) have been bound in the wrong order. There is a little age yellowing but this apart, the pages are reasonable clean. The images vary in size and are in b/w unless otherwise stated. PLEASE NOTE: There are pages missing; but what I have described above IS present - so if you are looking for something in particular in this issue PLEASE ASK. The process of the page numbering carry on from the previous issue, therefore do not start at number 1. The description of the contents above are in my own words and not necessarily what is written on the original page."Info." in the description is my research, although relevant to the accompanying image or article, is not necessarily in the text.This item will be packaged in a tube and sent RM small parcels (too big for lge. letter). Please note that I don't make profit on postage and packing; it is done at cost. The only profit made is by ebay as they charge me approx. 10% on what I charge for postage.